Enraged by Taliban oppression Malalai Joya became a women’s rights activist, and after the US-led invasion, took on the new regime as an MP. But speaking out has come at a cost. In a July 28, 2009 article, she tells Johann Hari of the Independent why death threats won’t stop her exposing ugly truths about Afghanistan. “I am not sure how many more days I will be alive,” Malalai Joya says quietly. The story of Malalai Joya turns everything we have been told about Afghanistan inside out. In the official rhetoric, she is what we have been fighting for. 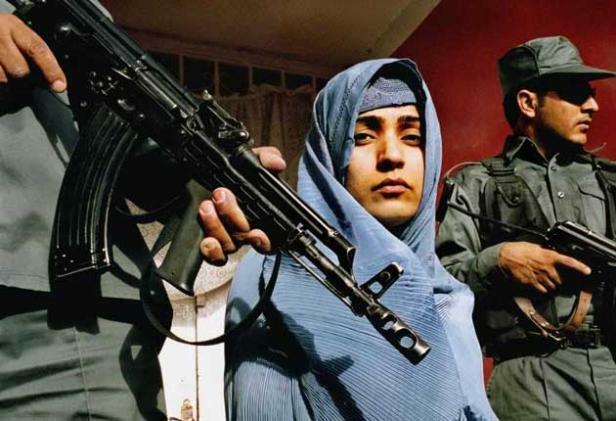 Here is a young Afghan woman who set up a secret underground school for girls under the Taliban and – when they were toppled – cast off the burka, ran for parliament, and took on the religious fundamentalists. But she says: “Dust has been thrown into the eyes of the world by your governments. You have not been told the truth. The situation now is as catastrophic as it was under the Taliban for women. Your governments have replaced the fundamentalist rule of the Taliban with another fundamentalist regime of warlords. [That is] what your soldiers are dying for.” Instead of being liberated, she is on the brink of being killed. I hope to enjoy the program of Malalai Joya. The so called peace alliance in Winnipeg is fueling the conflicts in Afghanistan. Manitoba Afghan Association and Manitoba Immigrant Support organization both heavily criticized the so called PEACE alliance. Could you explain what you mean? What did these groups criticize Peace Alliance for? Do you have any links to articles or letters that express the concerns of those groups, or can you give some better idea about what specifically PAW is doing to fuel conflicts? Mallai Joya should stop saying just and only about woman’s right, because there is no human right in Afghanistan. The last 30 years, every governor came and feed his group (Pashto) and others had no right and still have no right as they have. Islam had brought the human right for all mankind and protection for woman; there is Islam in Afghanistan, but not enough true Muslim. 75% of people who converted to Islam are woman. It shows they found protection in Islam. Judging from what Malalai was saying last night,it seems clear to me that she is advocating the human right of everyone in Afghanistan and around the world. she was very critical of those corrupt governors and warlords.I think if you read her book you will agree. I have no idea why the international community and the human rights groups around the world are fooled by Malalai Joya’s story, an ordinary woman from Afghanistan. I think probably because it is easier to raise money using her as a tool. Every Afghan is a victim of the actions of the Communist Regimes, the Mujahideen groups(warlords), and the Taliban. A wise person would not be fooled by what Malalai Joya is talking about. She asks for a withdrawal of the International Security Assistance Force (which she calls the occupying force) from Afghanistan without ever thinking about what would happen if the withdrawal happens. She probably knows that withdrawal of the International Force would take Afghanistan back to a stage of anarchy, but she does not want to mention it because then she would not be called a Revolutionary. The people of Afghanistan are sick and tired of revolutions. They want gradual change, but no more revolutions. People are happy that the Afghan National Army and the Police are getting their strength. People of Afghanistan know the importance of the Army and the Police and that is why they (the wise ones) support the International Security Assistance Force in helping their country build these important institutions. Every Afghan has suffered and everyone finds the Taliban, the warlords and the previous regimes their enemies. Every Afghan wants an end to the war. Every Afghan knows about the presence of corruption in Afghan government. But Afghans do not want to throw their government out and they do not want their law enforcement agencies to be dissolved. They want gradual change, not a revolution. They hate their political leaders, but they (the wise ones) have due respect for their law enforcement agencies. When Malalai calls for a withdrawal of International Force and tell the world to “leave Afghan people alone”, she is adding her voice to that of the Taliban and the warlords. She even opposes the Afghan National Army and the Police by calling them “a dollar Army”. By calling the International Security Assistance Force an “occupying army”, Malalai fuels insurgency and suicide bombing in Afghanistan. She makes Afghan’s lose hope in their government and law enforcement agencies and encourages them to revolt. She cannot be a representative of the people of Afghanistan. Her reaction and attitude is a true reflection of her personal rivalries with the members of the Afghan parliament, and definitely not a voice of the Afghan people and Afghan women. To achieve peace in Afghanistan, the military support of the International Community is badly needed. The Taliban and the Warlords cannot be finished without the establishment of a strong National Army and the Police. The presence of the International Troops provides an opportunity for the Afghan National Army and the Police to get strong and take on the responsibility to enforce the laws of Afghanistan. I do not understand why the International Community is still fooled by Malalai Joya. There is definitely something fishy here. I am very proud to have such a courageous and great woman like Malalai Joya in our country. She is our pride, she is a heroine of all times in my country. She is challenging very powerful warlords and their foreign masters that no one else dare to do so. All of the Afghan criminals, despite have billions of $ and gun and power, but they are afraid of Malalai Joya. Those who ask for foreign troops in Afghanistan does not know that history of the US/NATO; they have has not seen the pain and suffering of tens of thousands of Afghan who have lost their loved ones in the air raids of these troops. They don’t know that the US govt. only exports bomb, killing, destruction and terrorists to different counties and have never brought peace, democracy and justice to any country. They don’t know that Taliban, al-Qaeda and many other fundamentalist forces, under which our people are suffering, are products of the US govt. and it is very open secret today. They don’t know that even today despite long claim of “war on terror” they are supporting terrorists in Afghanistan and changed Afghanistan to the opium center of the world, which is more dangerous to Afghanistan then the Taliban and al-qaeda. It is pity to see that some Afghan critics of Joya are living in comfortable in the West and from there judge about Afghanistan. Joya is in the heart of Afghan society and knows better from anyone else about the hidden natures of the current occupation and the wrong doing of the US/NATO. They are supporting a corrupt and mafia state and pushing Afghan people to more disasters and tragedies. I agree with every point Joya says about Afghanistan. She is very right and really represents the very poor and suffering Afghan people. Dear Malalai Joya, go ahead you are our pride, you are our hope, you are our future leader, WE LOVE YOU! You’ve frighted every enemy of Afghan people so it is no surprise if they write against you here and there! It shows rightness of your comments and struggle. * Afghanistan is world’s worst place to be born: U.N.
Bravo Malalai Joya! I am deeply impressed by you. You are really the most courageous woman in the world. I know the nature of the Afghan fundamentalists that killing a woman is very easy for them, and its requires a heart of lion to face them and say the truth about them. Saying anything against these criminals from the western counties is not difficult, you are living inside Afghanistan still continue to face them that is really amazing. I wish you every success. Keep up your great fight! !